In part 1, we had estimated that the fiat cost of a transaction would be in the ball part of $0.001–0.01 USD, albeit with more room to go lower than higher. As each transaction requires at least 21 VTHO (default), the cost of an individual VTHO would be fairly low. Overall, initial returns on VET will be low, but this will improve as more partnerships rollout. However, even so, there is a good chance that VTHO rates will not be the main driver of VET’s price. In this part, we take a look at additional price influencers for VET in addition to providing some general concluding thoughts about VTHO. Note that references provided in part 1 will not be provided again. 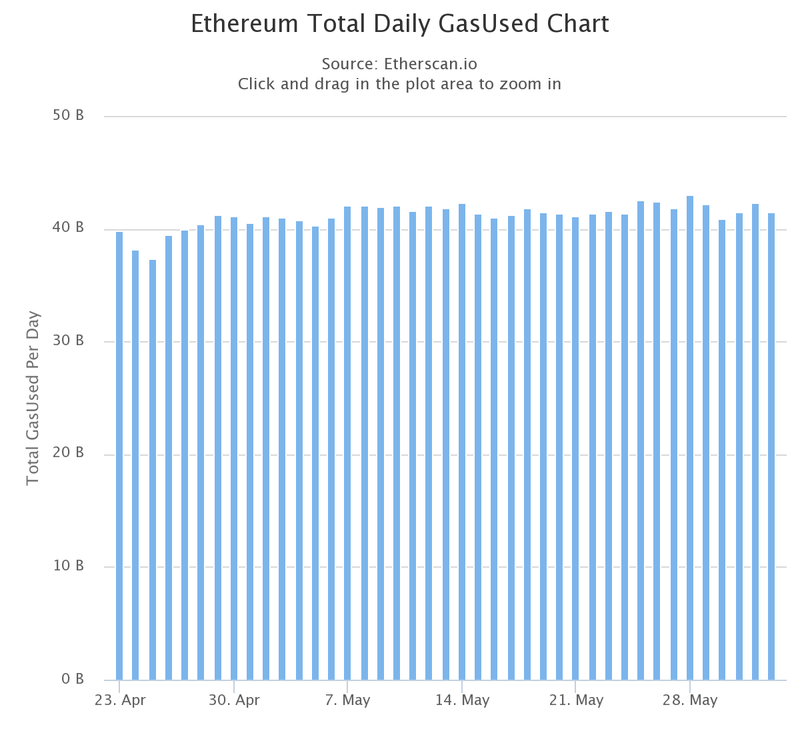 As mentioned in part 1, daily transactions on Ethereum were around 800K per day, with total daily gas consumption at around 40B. Using gas prices of 5, 10 and 15 gwei would mean that each day 200B, 400B and 600B gwei, or 200, 400, and 600 ETH is being used for transaction costs. At 800K+ transactions per day, we are sitting at around 10 TPS, which is near the maximum for Ethereum until they update their blockchain algorithm. If we keep up with this level of transactions for a year, with 200–600 ETH being spent on transactions per day, we would be looking at 73K — 219K ETH per year. Using an ETH price of 600 USD, this would equate to an aggregate of $43.8M — 131M USD in transaction costs. With a marketcap of around 60B, and if we assume that transaction costs were the sole reward for each block, the annual amount of rewards would be less than 1% (600M) of Ethereum’s market cap. While one could argue that there is also a block reward for mining ETH, with the current state of difficulty, cost of electricity, and cost of equipment, it’s not exactly a stellar ROI for the common miner. But at this point, even in ETH, the ROI is in the speculative nature of the token itself and its ability to appreciate. TLDR: From a cursory look, Ethereum’s annual aggregate transaction costs look to be less than 1% of its overall marketcap, with most of its value likely coming from speculation. is the contribution of VTHO to VET’s overall value. Now let’s take a brief look at the other terms. PVGC is based on pure speculation, much like how ETH and many other currencies are currently being valued. While PVGC is likely to be a big contributor to VET’s current value, given the massive speculative opportunity that is cryptocurrency, it is likely to play a reduced role as the industry matures (i.e. as more mainnets launch and adoption levels change). Rather, it is the last term, PVGB, which is the most interesting. With a pipeline of 250+ clients (as mentioned at the NYC meet-up, May 2018), there is a lot of opportunity for massive network effects. The scope of partnerships and adoption is well beyond this piece, and readers are encouraged to read up on it. As mentioned in the whitepaper, PVGB is currently impossible to gauge until more data becomes available (i.e. post-mainnet launch), but let’s give it some more thought and stress its importance a bit more. People have often (questionably) utilized Metcalfe’s law, which argues that the value of a network is proportional to the squared value of the number of users, transactions, or some other related measure of utility. There have been a number of people using Metcalfe’s law for valuing established cryptocurrencies and have found that there is some level of positive correlation. Incidentally, Sunny had sent out a tweet about Metcalfe’s law slightly before the x-node deadline — make of that what you will. But the point is that Metcalfe’s law and other similar network valuation models define a non-linear relationship, which, if thought of in an extremely simple manner, would mean that 1+1 > 2 in this context. While aggregate cost increase would similarly be non-linear, there could be other factors that would accelerate the growth in VET value faster than aggregate network costs (i.e. VTHO). In particular, we speculate that VET lock-up and enterprise utilization of VET will create an interesting effect, as alluded to by the last term in the equation. TLDR: Low VTHO ROI isn’t the end of the world. VTHO market cap is only a component of VET’s value. In particular, the network effect and VET lock-up may cause VET’s price to not scale with VTHO generation/returns. Let’s talk about lock-ups first. VeChain has been making quite a push to soft lock their tokens, which isn’t too surprising, as it would likely help improve VTHO liquidity and make it easier to forecast and regulate. We can see this through their use of nodes and x-nodes and the issuance of VeChain-vetted ICOs, which require at least 50% of their funds to be raised in VET. These ICOs can lock up a significant portion of VET. For example, the recent announcement of Plair’s ICO will contribute to a lock-up of at least $24M USD of VET while MustangChain is looking to raise $20M USD in VET. At the same time, VeChain reportedly has another 10+ ICOs in the pipeline. At this current point in time (end of May), the circulating supply of VEN is a little over 500M, half of which is locked up in nodes, which leaves ~250M in actual circulation. Using a price of $3–4 USD/VET (pre-launch), we are looking at a circulating value of $750M — 1B USD. Assuming 10 or so upcoming ICOs raising at least $25M+ each in VET, we would be looking to lock up at least ~$250M USD of VET, or roughly 25–33% of the remaining circulating supply, assuming the price doesn’t raise over the period. If the average cost of VET is ~$6 USD over the period in which the ICO’s are held, we would be looking at locking up ~40M VET. At $8/VET, we would be locking up ~30M VET. Because the network may take some time to get up to speed, the price may not be appreciating much, resulting in the lock up of more coins than expected. TLDR: Soft VET lock-ups can cause a large decrease in circulating supply in the near- and mid-term, with X-nodes having already locked up around half of the circulating supply. If prices remain low, upcoming vetted ICOs can likewise temporarily lock up significant portions of the remaining supply. At this point, we would like to refer back to the network effect that we mentioned previously, which would play an important role. As more enterprise and retail users make use of the platform, there are more and more ways for exchanges of value to happen. However, being that we are still in the early stages of adoption, there will probably be a number of barriers in the way, but general market trends and development look positive overall. The recent disclosure of the Multi-Party Payment Protocol by VeChain shows that VeChain is trying to find ways to get around barriers to adoption. Needless to say, holding VET for use in smart payments is based entirely on speculation, but the potential certainly is there. And unlike many other coins, there is an actual client base. An increase in business adoption promotes an interesting dynamic when paired with ICOs and other lock up mechanisms. The longer the price stays low, the greater the number of tokens that will be locked up. As utility for the token picks up, due to low(er) VET supplies as a result of higher lock ups, we would likely observe a rapid rise in prices to satisfy demands. Admittedly, we will have to wait and see how average transaction size and average transactions per second evolve following launch of the mainnet. Readers can read up on the idea of token velocity for additional details. Likewise, one thing that seems rarely mentioned is that enterprise demand will help build up price resilience, as it provides an intrinsic value for VET, unlike many of the other available currencies. If and when the currency value of VET exceeds the value from VTHO returns, then VTHO returns, as a percent of VET will decrease (The same would also apply for the speculative value, as discussed above). While this would help VET detach from BTC, it will likely take a fair amount of time. If adoption is quicker than expected, it may suddenly occur in rapid bursts. Conversely, if uptake is poor, then there’s not much else to say. TLDR: Soft lock-ups would help drive up the value of individual VET tokens as they become more utilized as a carrier of value/smart currency. The greater the lock-up, the larger the growth in value. Buy my VTHO: Sure there’s VTHO being churned out regularly, but will anyone buy MY VTHO? Most likely. Let’s say there’s a holder of 25M VET post mainnet (250K VET pre-split). They would be generating 10.8K VTHO per day. Node bonuses would probably increase daily rates by 2–3x for the first year or two, so we’re likely looking at 21.6K — 32.4K VTHO per day. If we assume that VTHO is price stable (more on this next), then the gas cost would be 21 VTHO per basic transaction, which gives us the equivalent of 1.0K–1.5K basic transactions per day. If we assume that the average transaction cost is instead around 50 VTHO (refer to part 1, where we determined the average gas price in Ethereum), we would instead be looking at an equivalent of 400–600 actions per day. This isn’t a lot of transactions, but then again, the numbers are based off of the initial rates, which translates to a total estimated VTHO market cap of $1M — 10M USD and assumes that the network is operating at 10–30 TPS (determined in part 1). So instead, let’s now say that the network picks up speed — we 100x all our numbers! That means we would generate enough VTHO for 100K — 150K basic actions, or 40K — 60K “complex” transactions. Is this a lot? Let’s take a look at Mlily again, with their 20M tags per year. Assuming they use each tag ONCE, that would be an average of 55K transactions per day. Odds are, even with 25M VET, they might need to pick up some extra, especially if they will be heavily integrated with IoT sensor technology and/or VeChain’s ecosystem. The other point to note is that by the time VTHO generation has reached those levels, there has likely been significant levels of adoption, so VET will likely have appreciated, and there will be more users looking to utilize the platform. With a price appreciation in VET, it may be more beneficial for users to buy VTHO instead of VET, depending on their scale and plans. The only holders that will likely have excess VTHO will be the authority nodes, but then again, they are the ones out there campaigning for VeChain much like DNV GL; moreover, there are only 101 authority nodes. Taking a look at this from another angle, with a pre-mainnet supply of 867M tokens, assuming everyone buys 250K nodes, we’d be looking at a maximum of around 3.5K nodes. When we take into consideration how much of the supply will be held by VeChain foundation (39% as of latest report), DAPPs (i.e. Plair & MustangChain), and everyday holders, it’s unlikely we’ll see that many high value nodes. The reality is the system can support only so many nodes at that level. If enough enterprises choose to purchase that quantity of VET, they could potentially corner the market and sky rocket the price of VET — admittedly not something we’d mind. However, such a move would hardly justify the VTHO returns. At some point, it would be more economically feasible to simply purchase VTHO as opposed to trying to generate it. This is particularly true if VTHO yields are a relatively minor part of VET’s ROI. Clearly, there are many dynamic aspects in play, but it’s unlikely that there will be no market for VTHO. On VTHO rates: VTHO is an interesting concept — a tradable credit for accessing VeChain’s ecosystem. While the price of VTHO can raise, VeChain can keep usage cost in line by altering the amount of VTHO used in a smart contracts and payments. However, if people are trying to speculate on VTHO and hold it, it will likely introduce a certain level of volatility, as prices spike and drop with people trying to capture profits. Moreover, this could contribute to lower liquidity overall, so more slippage may be occurring for consumers looking to do larger VTHO purchases. This makes it harder to keep stable prices for contracts and transactions, as we assume an oracle would be needed to translate VTHO costs into some fiat equivalent. From purchase of VTHO through an intermediary to carrying out transactions, a few minutes may be required. If prices can rise and fall like some of those one- and five-minute candles on BTC charts, then that may pose a problem for maintaining stable transaction costs. Slower rises and falls, in contrast would be less likely to have such a significant impact. With the threat of increasing VTHO generation, people would be less likely to hold VTHO, as it won’t necessarily appreciate. The optimal choice would be to sell and invest in assets capable of better levels of appreciation. This would likely lead to increased liquidity and more mild price swings for VTHO. Regardless of what happens, the aggregate value of VTHO generated per VET will be increasing as the ecosystem grows, so there’s no real concern. TLDR: Firstly, there will most likely be a market for VTHO buying and selling, even if companies hold VET. Secondly, VeChain’s ability to increase generation rates, in addition to altering VTHO consumption in smart contracts and transactions, will help increase overall stability and liquidity, which will help adoption. Adoption and cryptoeconomics is the heart and soul of any platform solution. Unfortunately, owing to the lack of more granular details, a lot of the valuation comes to guesses, estimates and massive simplifications. However, this type of exercise can help us develop a simple foundation to think about prices and guide short- and long-term expectations for VET and VTHO. With a seemingly high amount of interest and quick pace of adoption, we will hopefully see transactions increasing within the VeChain ecosystem. While overall returns from VTHO may be less then satisfying, in the long run, we would like to believe that increased utilization of the blockchain ecosystem would drive up VET prices. VeChain is looking increasingly likely to decouple itself from BTC in the near future, hopefully for the better, as its economic foundation begins to take a life of its own. Over the next couple of weeks, we look forward to the announcements regarding the launch of the VeChain platform, following which we can take a deeper look in to the ecosystem and refine our outlook as more metrics become available.